With all the travel you're doing has the climate change affected the horses? “Stacy, With all the travel you’re doing has the climate change affected the horses any? Do you do or give them anything extra? I know from driving a truck you can be in shorts and 90 degree weather and in 24 hours be in sub freezing temps. It caused a lot of cold symptoms with me.”-Jeff B. We haven’t had issues with the travel negatively affecting the horses. There are probably several reasons for this. We knew we were going to be traveling to a variety of climates with the horses so we began blanketing them in the fall. This has given us the ability to regulate their ‘coats’ easily. We have seen other horses that were hauled into the warm weather in Arizona that had grown full winter coats. At night the temperatures dropped and we put blankets on ours and during the day the temperatures were in the mid to high 70’s and our horses could be naked. The other horses didn’t have that flexibility. Does the reduced heat stress make life easier on the horses? My guess is that it did and may have helped us keep them healthy. We have kept their feed consistent although we do buy hay along the way. It has been easy to get consistency in the hay because most of it is coming from irrigated fields and the bales are amazingly similar. We also transition any hay changes gradually. Our horses were also accustom to travel before we began this bigger journey. They have been hauled to horse shows and other places to ride all of their lives. They are also young, four and six, which makes them a bit more like teenager humans…very resilient. Another possible key is that we are making a s-l-o-w trip unlike what you described. We tend to work our way to one area and then stay there for awhile. If we do happen to make a bigger move, several days of travel in a row, we skip riding the horses and pay close attention to any changes we may need to make in their blankets, windows or vents. 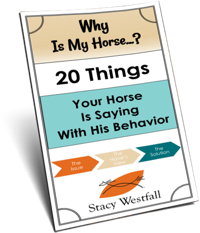 I worried some before the trip began about how we would handle things if a horse did get sick and then it dawned on me that I would handle it pretty much the same as if one of my children got sick. A few years ago on a trip to Colorado one of my sons woke up not feeling well. We were on our way to see the four corners but we stayed an extra day in the hotel. One extra day turned into two and then three. We never did make it to the four corners…but our son got feeling better and we just skipped that part of our trip. Below is a video of our horses having fun on a hot day last week in California! Good information. Great to see the horses having fun. Newt is a hoot! Yes, Newt dreams that he is an Arabian. That is him snorting and prancing. Watching him makes me think dressage…he better be careful what he shows me! My riding days are oer, again. They were over for 12 yrs. after bucked off a mustang. But in ’11, after seeing Bucket List, got a Paso Fino. Had to learn to ride all over again with gaited horse. Had ridden only stick shifts. Had summer in the sun in ’12, (age 82) get in ribbons 3 shows, one was regionals. High Pt horse at Rgnl. But Spring of ’13, too hard on old joints. So my carriage is again horseless. How do you school the kids? Home school? Tutor? I’m a Dyslexia Therapist, work with families locally, and starting to work with families on line w/ Skype. Program software is free. Diagnostics are free. Training of parents is free, in cooperation with Salvation Army. I like your amazing free reining. Fun to watch. I noticed you keep their halters on. I was told never to leave my horse loose in the arena with his halter on, so I always took it off. Once in a while, he was a good horse after all, he wouldn’t let me catch him. I learned that if I flipped the lead over his neck or shoulders, he would stop and let me re-halter him. Probably doesn’t work with other horses so well unless they’ve been trained. So, I think I have two questions: 1) Halter or no halter in the arena; 2) How do you catch them if they don’t have a halter and won’t let you put it back on…assuming they are not trained? Thanks! Love your videos! I would just wait till they have run out of steam and then have a carrot or two to give them with out having a halter near by. Wait a few minutes till they start milling around (walking slow) and then slowly approach them with halters. Give one more carrot as a treat for letting me catch them. If They wont let me catch them , there is no treat and no supper! When they are hungry they will be glad to let you come up to them. Now that’s how I handled my spoiled horses when I had them. I only had the halters on because I was standing there. People were getting ready to ride in the arena and my horses were just getting a bigger place to play for awhile. Normally the halters are off so they can’t get caught on anything. You already answered the question…sort of, lol. They do need to be trained for easy catching. I made a short video talking about this but I haven’t edited it yet. I will get it done someday! The way I have always been taught to get a horse to come to you is teach them that coming to you is the easier choice. So first you need to have some sorta call that tells them to come. 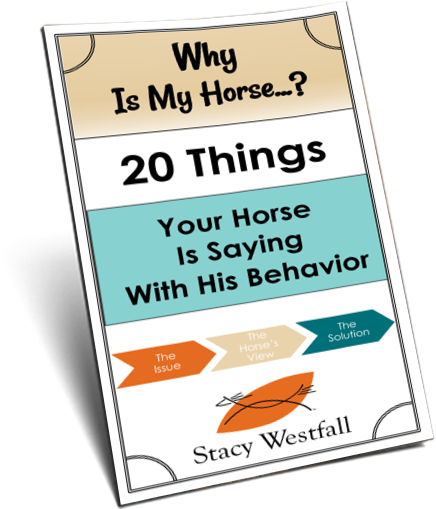 I teach my horses this by going into their pasture with grain and giving the command as they come up, or when they are walking up to me in a stall. Eventually they start to realize that the noise means come to me. That being said, when they are in a bigger area and you give the command and they ignore it, what I always do it show them that “fine you don’t wanna come you can move your feet until I tell you to stop and we can try this again.” In other words make the wrong thing hard and the right thing easy. Mine have realized pretty quickly that they can be so much happier and lazier if they just come when I first call. Love watching them run free like that! These are the same horses that calmly walked through the McDonalds and Starbucks driveup? Yep! The very same ones! That was a very good question, I have been wondering how you managed all the different weather changes. Fun video of the horses playing. LOVED this!!!! !…was that Newt snorting? ?……he is gorgeous!!!! and that Hope rearing at the end was awesome!!!! She reminds me of Vaquero!!! she is Beautiful!